I woke up on the train this morning. Granted, I got myself out of bed, showered, slightly caffeinated (if half of a room-temperature diet mountain dew counts, that is. And for the record, it was disGUSting.) and drove myself into DC to Union Station while awake, technically. It's girls night in Brooklyn with M and C, 2 fab women that I like a whole lot, but don't see often. My travelling compadre missed the train, though. So, rather than hopping right into conversation and planning, I watched the sun rise. Bought a cup of coffee after an hour or two...let the withdrawal headache flirt with me a little before squashing it. Listened to great mixes from LMB, ACB, the Texas Avocado and the Wise Soprano...it was a little like having them along for the ride. Dove into a new book that hit just the right tone. Watched my fellow passengers doze, eavesdropped on those who were chatty. An unplanned morning, rich and perfect. Sometimes Plan B really is the best! 1. Sunlight through thick train windows. 2. Friends with great taste in tunes AND a healthy sense of irony. 4. 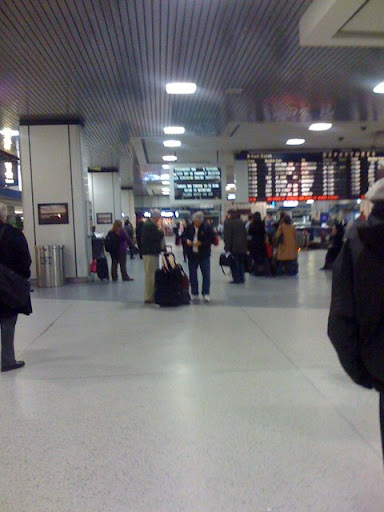 Improvisatory dance solos in Penn Station.